Flowers in Bloom for Your Summer Wedding! 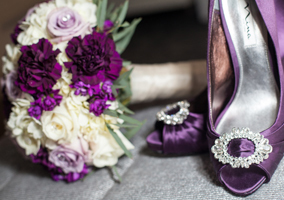 Flowers are one of the main focal points of any wedding and can quickly become a major expense. 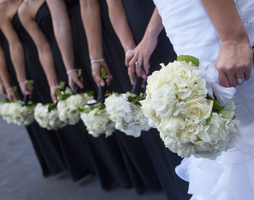 One way to keep costs down is to opt for flowers that are in bloom during your wedding season. Since summer wedding season is here we thought we would share some of our favorite flowers that won’t break the bank! Alstroemeria: Alstroemeria are in bloom in late spring or early summer so they are perfect for a May or June wedding. These colorful flowers are also known as Peruvian Lillies and come in a wide range of different colors (over 150 shades!) so they are perfect for any color pallet. Carnation: Carnations are the perfect flower for weddings due to their lengthy sturdy stem which is great for tall elegant arrangements. They are also perfect for long wedding days because they have a long-lasting bloom even hours after being cut. Carnations are in bloom during late spring so if you are getting married in early summer they may be a great fit. Daisy: Daisies are a great staple flower, whether being used as a filler flower or to make up an entire bouquet. Daisies may even bring back childhood memories of plucking the white petals off wondering “he loves me, he loves me not”. Daisies are in bloom throughout the summer and into early fall and make an affordable whimsical flower for a more casual wedding. Sunflower: Sunflowers may be the most summer time flowers of them all. There is something about the big bright petals that just make you happy when you see them. Their bright gold color adds a great pop to any floral arrangement. Sunflowers are in bloom throughout the summer. Baby's breath: What was once a filler in bouquets and centerpieces baby’s breath is making a comeback on its own. Lately, we have seen lots of brides using baby’s breath in big mounds, which gives a gorgeous whimsical look and goes great with long trailing pastel color ribbons. Baby’s breath is also great for making delicate and airy flower crowns perfect for any summer wedding.